Desirable memorabilia from the collection of Leafs legend Tod Sloan, we have items that were presented to the three-time Stanley Cup champion, along with a few souvenirs from his life outside of hockey. Included, we have a rarely seen 1951 Stanley Cup silver box (4” x 3 ½” x 1 ½”) with “Tod Sloan” engraved along with “1951”, Leafs Sterling “AM Sloan” money clip with an engraved date of “Feb 3, 1958”, a Ronson lighter with “Tod Sloan” and “1949” engraved and a Schaefer NHL “Player of the Week” Dunhill tankard with “T.S.” and “10-21-50” engraved. 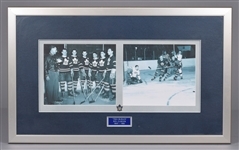 There is also a framed display (18 ½” x 30 ½”) with a pair of inserted Leafs photos along with a name plaque with “Tod Sloan Hockey Career 1947 to 1961”, a Leafs vs Bruins program from 1955-56, Sloan’s Certificate of Discharge from the Canadian Military dated “Dec 17th 1943” and much more! An LOA from the Sloan family will accompany. 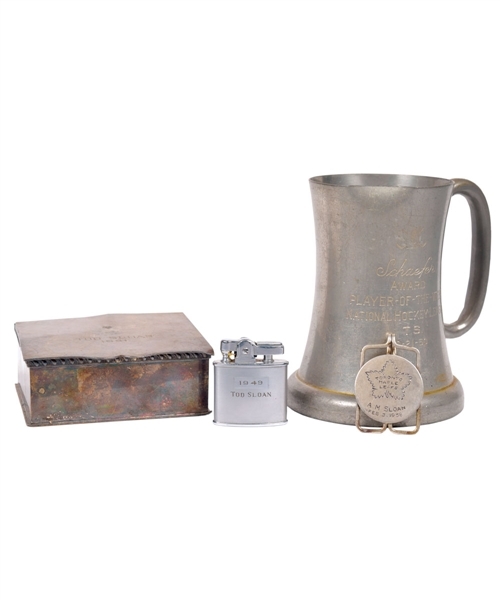 Also included, we have Tod’s 1948-49 Pittsburgh Hornets “Member of Hat Trick Club” award – a small 2 ½” metal top hat with engraved text over the underside of the brim, a toiletry travel kit with “AMS” in gold over the case, a copy of Sloan’s Application for Merchant Seaman’s Identity Certificate from 1943, a 10” “NHL Oldtimers” plate with inscription over the reverse, A Leafs Reebok souvenir jersey (size 52) with "Sloan" nameplate, three Leafs souvenir pucks and more! 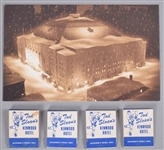 The 1951 Stanley Cup presentation box has a detached lid with the small Stanley Cup broken off, with tarnishing throughout. The lighter and money clip both show light wear from use, while the tankard shows heavy surface wear with a bent rim. 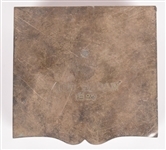 The Leafs program has been handled with an intact center line-up and minor spine wear, while the Certificate of Discharge shows heavy wear with toning and creasing and is split in two along a fold line.